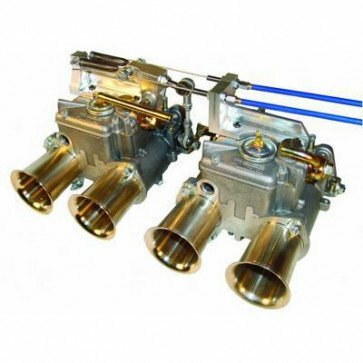 A twin cable linkage kit for twin Weber DCOE carburettors has been designed with strength, durability and smooth operation in mind. 2/ Quadrant arm pivot bush is made from phosphor bronze (self lubricating). 3/ Twin spring loaded quadrant to shut throttle in the event of cable or spring break. 3/ Lateral adjustment of drop arm. 4/ Rose jointed drop arm for smooth throttle action. 5/ Thottle cables 1 metre (nylon sleeved) x 2 + alloy Sytec Motorsport pedal block supplied.